To make use of the parallel programming port, you need a connector like that shown above. 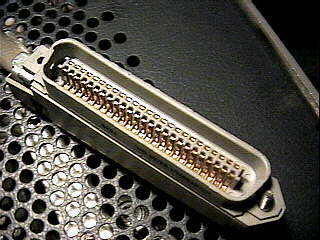 The one shown is a standard office telephone connector. Ask your telephone repair man for a short 25 pair jumper cable (25 pair = 50 pins) and you might get what you need for FREE!. You can also find this connector at a computer store. It's known as a SCSI-I connector. But expect to pay top dollar for it unless you're lucky! Another option is to purchase an Amphenol 57-30500 connector as described on page 23, 30 & 35 of the manual. I cut mine off of a 25 pair office telephone cable leaving the wires a couple feet long so I could solder the DB-25 on the other end to plug into the printer port.